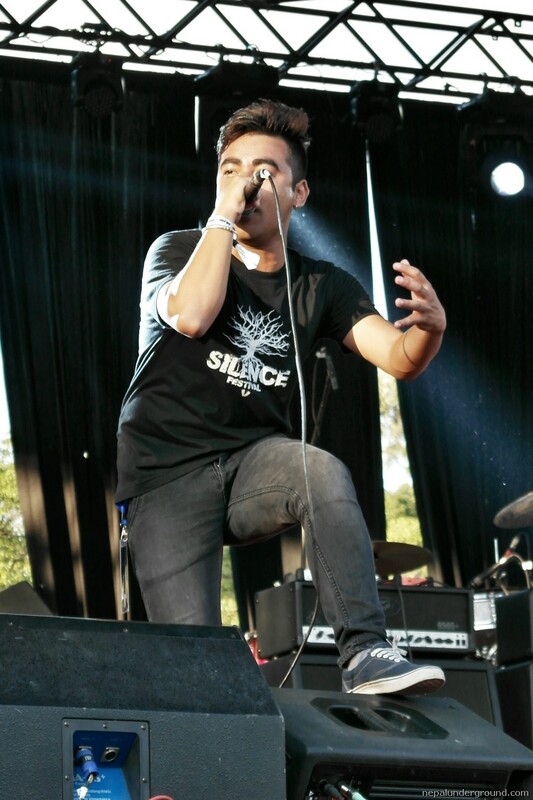 This year’s Silence Fest kicked off from October 17 at Bhrikutimandap Ground, Kathmandu and lasted till October 18. Silence Fest V was bit different from previous installments as Silence Fest V was a two days event, plus there was Nepal Inked – International Tattoo convention happening along side the festival. Silence Festival is known for bringing the international bands to perform in the home ground, offering the locals international tier music festival. 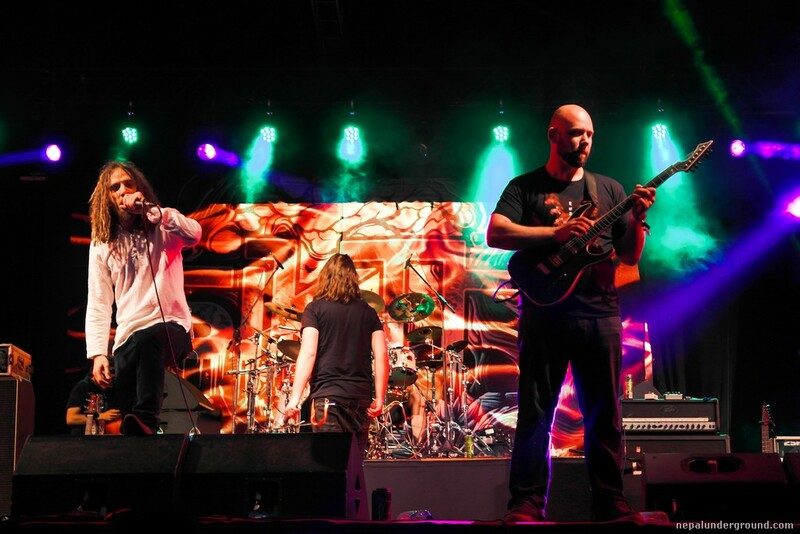 The anticipations & expectations from Silence Fest V were high, as Sikth (UK) & The Algorithm (France) were headlining this year’s Silence Fest. 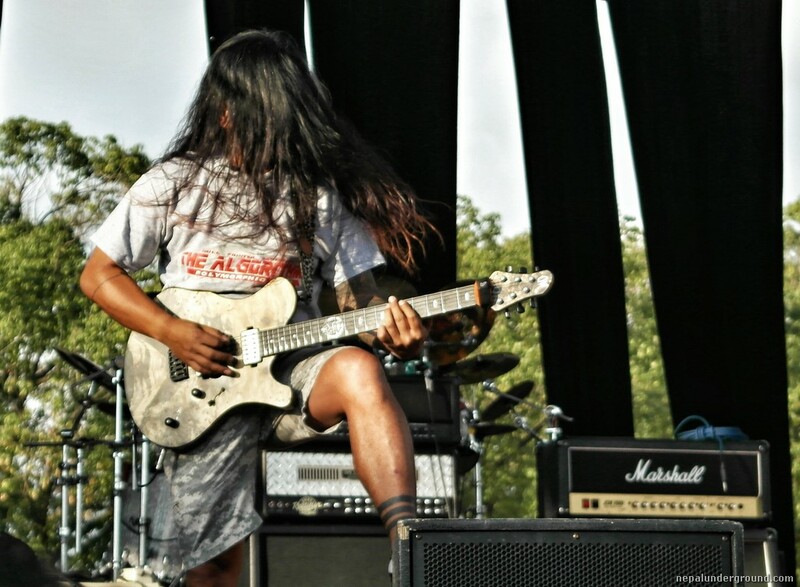 Day 1(October 17) of the event kicked-off with the Kathmandu based technical death metal band “Antyesti”. The show started bit late around 3pm (I guess), crowd gradually began to enter the venue as the band started their set-list. They mostly performed their original songs and cover song of Dying Fetus & Necrophagist . Following up “Antyesti” was “The Exorcist” another death metal band from the valley. Both of these bands were runner-up of “Dean Battle of Bands 2014” and were on their best. With their energetic performance, the band managed to pull half of the crowd in but other half could be seen sitting in the shade. Next band in the lineup was Divine Influence, groove metal band from Kathmandu. They had recently released an EP and music video for track “Scarecrow” on the eve of Silence Fest. The band mostly played their original tracks off their début album “Scarecrow”. Though there were chants for “Lamb of God” cover, they stuck on playing their original material. Nevertheless, their performance was enjoyable and got people moshing. Though the next band on the lineup was Cheisrah (India), due to technical problem they couldn’t make their appearance, where as schedule of “Mahadev Cometo” (Switzerland) got postponed for next day. The last band for day 1 – Jindabaad finally hit the stage and was welcomed with applause. This time Jindabaad performed without keyboard and there was Bijay Shrestha (Ugrakarma) on bass. Regardless, their performance was mesmerizing. They totally got the audience involved in their performance. 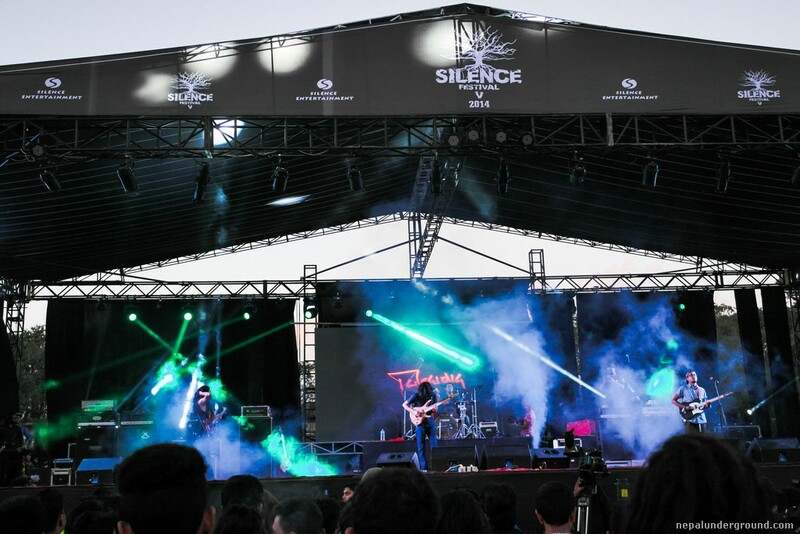 Second day of Silence Fest was much awaited as “Sikth” & “The Algorithm” was supposed to play on this day. Due to some problem I reached the venue bit late. By the time I reached Bhrikutimandap, Breach not Broken had already started their set-list. Though I couldn’t watch them, I assume everything went smooth. Breach not Broken was winner of Dean Battle of Band 2014 & 10th ICMC. They were able to pull off energetic show even in limited space of indoor venue; I guess they did well in this time as well. Next band on stage was groove/core band DamagEra from India. The venue was faintly populated when they commenced. Half of the crowd could be seen sitting in shade (may be scorching sun?) and half moshing/headbanding. The band received the good response from the crowd for their energetic performance. Kalodin was in stage after DamagEra. They were playing after a hiatus but were flawless as they were back then. The band now seems to have left their anti-christ material behind and adopted Hindu-mythology as theme, mixing it with black/blackened metal. Tumbleweed Inc. was on the stage next. They play funk rock mixed with rap somewhat like of RATM, with heavy distortion driven guitar and aggressive rap vocal. The band managed to get the crowd on their feet and get involved with them. Following of Tumbleweed Inc. Underside was on the stage, everyone on the ground were in their feet as they entered the stage, when they began their set list crowd just went wild. And there was body suspension in the stage with Underside performing “All notes off” alongside. They totally brought the much-needed energy to the show. One can’t remain idle while they play, as always Underside delivers the best! 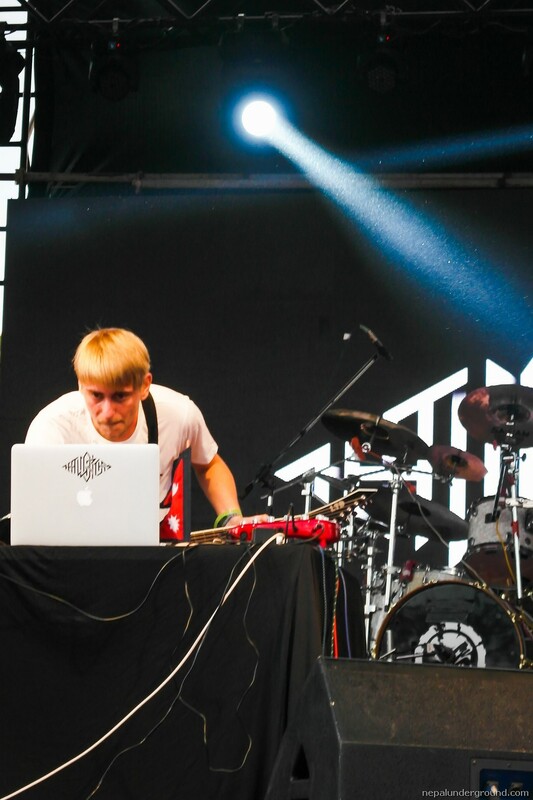 Finally, it was the time for guest bands – Remi Gallego of “The Algorithm” was on stage. I was expecting a drummer & guitarist besides Rémi Gallego. But we saw Rémi Gallego handling guitar as well as sampling/midi controller all alone. All by himself, he pulled off an amazing show. After “The Algorith”, Sikth was on the stage. They took some time to manage the sound but when they kicked-off, it was worth waiting for. Sikth came back from the seven year hiatus starting with Download Festival 2014 (July), Silence Fest did an excellent job to welcome their reunion. Sikth were totally insane, the band managed to get two mosh-pits (one at left and another at right). We saw Sikth playing their classics such as Pussyfoot, Bland Street Bloom, Flogging the horse etc. They were definitely the starts of the show. We are lucky to see them live, as there are rumors of band going to hiatus again. If I was to rate Sikth’s live performance it would be 10/10. The show ended with “Mahadev Cometo”, they are basically sitar + drum + visual effects (ink projection, I guess it is the name for it). A perfect music to relax you. Just like every year, Silence Fest delivered the best show Nepal can have. Few days after Silence Festival V, Silence Entertainment unveiled the design for Silence Fest VI fueling the curiosity regarding next installment. Analyzing the logo design I guess they might put death-metal act as headliner for 6th Silence Fest.